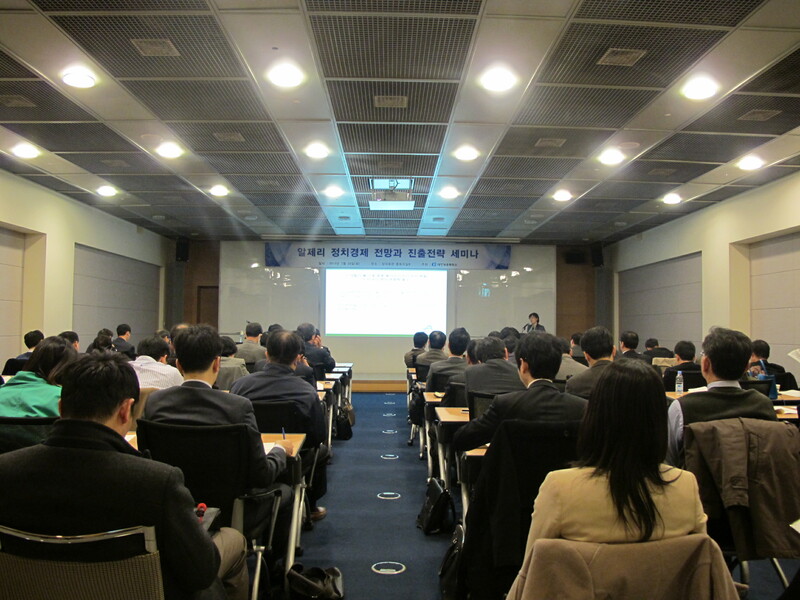 On Tuesday, March 26, 2013, Dr. Jang Ji-Hyang, Director of the Middle East and North Africa Center at the Asan Institute for Policy Studies, was a keynote speaker at a seminar hosted by the Korea Chamber of Commerce and Industry. Titled, “Views on Algeria’s Politics and Economy and Market Entry Strategies,” the seminar brought together more than 80 participants from Korea’s largest companies in the engineering, construction, energy sectors, and law firms. The goal of the seminar was to discuss some of the key developments in Algeria since January’s Amenas hostage crisis, which led to the deaths of 37 foreign workers, as well as the broader political and economic circumstances in North Africa since the political upheaval of the “Arab Spring” nearly two years ago. In her presentation titled, “Algeria and North Africa after the Arab Spring,” Dr. Jang argued that several key domestic factors explained why Algeria was not part of the wave of uprisings in neighboring Tunisia, Egypt, and Libya. She noted that whereas the protests in other countries tended to coalesce around a nation-wide opposition movement, this was not the case in Algeria. Instead, since the 10 year long civil war between the military government and the Islamic Salvation Front (FIS) which resulted in 200,000 deaths, the government marginalized some Islamists who became radial Jihadists. At the same time, the government co-opted others into its system and pre-empted the establishment of a broad coalition that could harness widespread discontent. Consequently, despite estimates of more than 9,000 protests and riots across the country each year, localized unrest has not escalated into a national uprising mainly due to the absence of a viable movement and organization. Dr. Jang went on to note that Algeria was like other “bunker” states such as Saddam Hussein’s Iraq, Muammar Qadhafi’s Libya, and Bashar Al-Assad’s Syria, in that rule by coercion and a weak private sector left little scope for negotiation or compromise. As new democracies in Iraq, Libya, and Egypt struggle with instability, Algeria’s authoritarian system may actually appear more stable. However, according to survey results by the Arab Barometer Survey, more than 75 percent of citizens express mistrust in the existing parties and civil organizations. This suggests that while they are not satisfied with the current state of politics, they just do not have a viable movement yet.